In this Feb. 26, 2019, photo taken by the Australian Maritime Safety Authority near Rennell Island in the Solomon Islands shows the “MV Solomon Trader” ship which ran aground Feb. 5. Australian officials say an environmental disaster is unfolding in the Solomon Islands after the ship ran aground and began leaking oil next to a UNESCO World Heritage site. An environmental disaster is unfolding in the Pacific after a large ship ran aground and began leaking oil next to a UNESCO World Heritage site in the Solomon Islands, Australian officials said Friday. Footage taken this week shows little progress has been made in stopping the Solomon Trader ship from leaking oil since it ran aground Feb. 5, according to the Australian High Commission in the Solomon Islands. 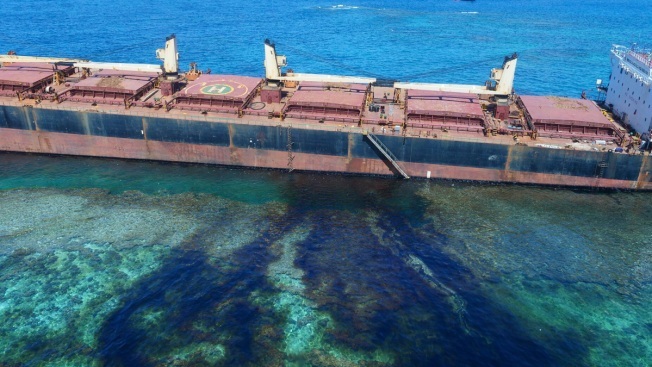 Australian experts estimate more than 80 tons of oil has leaked into the sea and shoreline in the ecologically delicate area and that more than 660 tons of oil remains aboard the Hong Kong-flagged ship, which is continuing to leak. The ship was chartered by the Bintan Mining company in the Solomon Islands to carry bauxite, which is used in aluminum production. Bintan Solomon Islands chief executive Fred Tang was not immediately available for comment Friday. Australia's Department of Foreign Affairs and Trade said there was a high risk that the remaining oil would leak and it was "profoundly disappointed" by the slow response. It said the Solomon Islands government had advised it that the responsibility to salvage the ship and mitigate the environmental impact lay with the companies involved. Radio New Zealand reported that the ship's owner King Trader Ltd. had sent a team to help with the salvage operation while Bintan had claimed that as charterer, it had no legal responsibility for the ship or liability for the accident. UNESCO has designated the southern third of Rennell Island as a World Heritage site. It says the island is the largest raised coral atoll in the world and is a "true natural laboratory" for scientific study. It's also home to about 2,000 people, whom the High Commission notes rely on the ocean along with the natural resources of the island for their livelihoods. Both Australia and New Zealand have sent experts to help with the monitoring of the oil spill and the potential salvage of the ship.